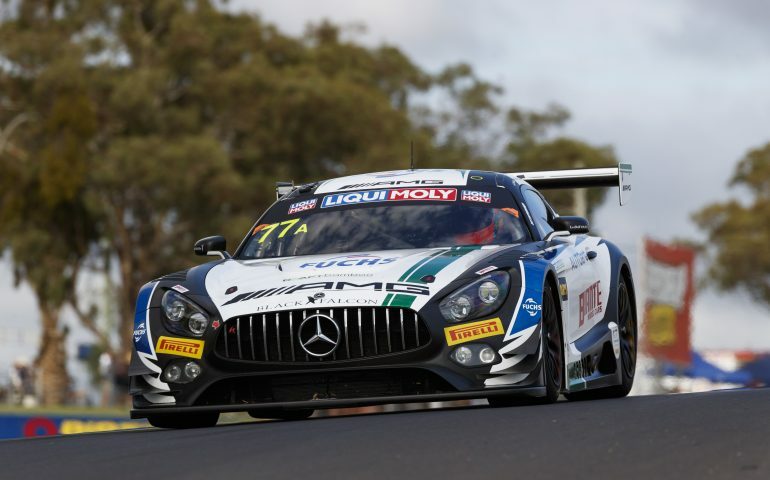 THE opening two hours of the 2019 Liqui-Moly Bathurst 12 Hour has seen the Mercedes-AMG GT3 entries of Craft Bamboo/Black Falcon and Team GruppeM Racing dominate the race so far. Craft Bamboo/Black Falcon driver Luca Stolz has a narrow lead over the chasing pack in the opening stanza of the race, taking control of the race after the first round of pit stops saw him jump the leader for first position. Leading from pole position, Maximilian Buhk in the #999 GruppeM Racing machine checked out at the front of the field early on, taking Stolz in the trailing #77 entry behind him. The duo opened up a sizeable five second lead to Bentley’s Steven Kane early on, seemingly working together to put a gap on the field as Kane himself started to run away from those behind. At the end of the first hour, the gap from Buhk to Kane in third was a healthy five seconds but the gap back from Kane to fourth placed Dirk Werner was a massive 20 seconds after just 26 laps. Only two cars in the opening hour put in laps under the 2:04 mark, both being the M-Sport prepared Bentley Continental GT’s. Vincent Abril’s time of 2:03.6988 was put in early on on lap 21, just as the sun started to come up over the track. Luca Stolz went quickest just after the turn of the first hour, clocking a 2:03.6111 while hunting down Maximilian Buhk in the lead though the gap remained at a relatively consistent one second margin. The first round of pit stops for a majority of drivers came around the lap 30 mark, the leaders came in a few laps later with Stolz jumping Buhk for the lead while Kane took on tyres, dropping time. David Calvert-Jones caused the first safety car to be deployed after spinning the #12 Class A Porsche 911 at Sulman Park, avoiding the outside wall but hitting the inside concrete on approach to McPhillamy Park. Racing resumed on lap 42 with Stolz leading from Buhk still with Kane applying pressure to the Mercedes-AMG GT3 machines early on after the restart. While Stolz started to eek out a margin over the chasers behind him, Buhk had his hands full keeping Kane and Abril behind him in, wanting to keep it as a Mercedes-AMG and Bentley 1-2/3-4. A late safety car came out on lap 49 after a crash involving the #27 HubAuto Corsa entry, driven by Nick Percat, and the #96 Class I MARC Cars machine of Mathijis Bakker. Stolz leads the pack under the second safety car of the race.